The Selchau family took energy conservation measures before installing a solar PV system, including purchasing an Electric Vehicle (EV). Enjoying clean driving and lower fuel expenses, the Selchau family was still concerned about high energy prices, global warming and achieving energy independence. Solar power for their home was an easy decision. After speaking to several solar integrators, the Selchau family chose SolarCraft, for its professional service, longevity and knowledge in the industry. After they flipped the switch to solar, they realized immediate savings with a 92% reduction in their monthly electrical bill. Now they can charge their EV any time and with skyrocketing energy prices, not having a fuel or electric bill is a big plus. 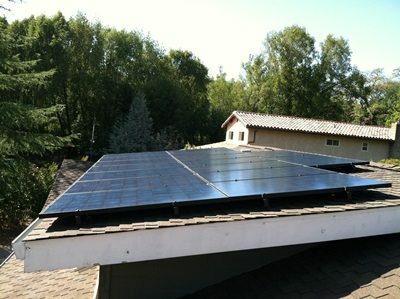 Roof mounted, the solar panels help protect the roof as well as help insulate the home. The system consists of 16 solar panels, each controlled by an Enphase micro-inverter. In this configuration, each panel is linked to a micro-inverter to maximize energy production and reduce the impact from shading. Overall system efficiency is increased by 10 – 12%. Will reduce CO2 emissions by 2.5 tons annually, equivalent to eliminating over 6,000 miles of driving each year.